I’ve traveled many places, visited many cities, but there is something special to New York. Intangibles among the countless tangibles make New York such a special city. But, I am not sure many people think of even catching a sunset when in New York. Let’s face it, there is so much else to catch. 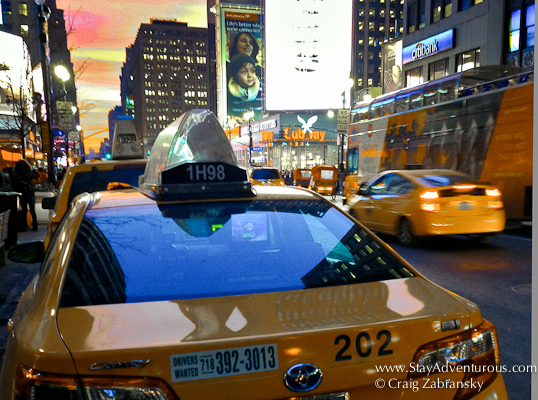 Catch a cab or the sunset? And if I was recommending a place to watch a sunset, I recommend walking the Brooklyn Bridge at sunset. Take the subway to Brooklyn and then walk towards the setting sun over the New York skyline that even includes a view of the Statue of Liberty. But I am also reminded nightly a sunset happens. Whether I am enjoying a cocktail at Ink 48 at sunset or at an event overlooking central park at sunset, it happens, and it delights. I love New York City, and make no mistake I wanted a New York sunset in the 2015 Sunset Sunday Calendar, but this sunset made the calendar not as a tribute of my favorite city, but rather to remind us that the sunset happens at home too. You don’t need to travel and take holidays to appreciate sunset magic. No, the sunset occurs right in your own backyard too. Sometimes its great to enjoy a sunset at home. Great reminder, beautiful sunsets can be seen right at home if we just stop and take the time to appreciate them. One of my favorite cities (well, probably my favorite city). I need to stop enjoying happy hour so much when I’m in New York, or at least do so while enjoying a sunset so I can actually experience it.